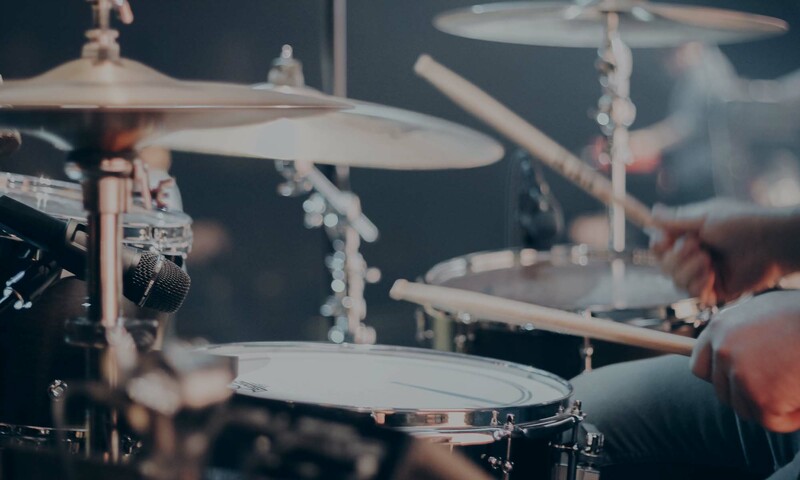 In the last article in this series we talked about an acoustic kit buyers guide for those just starting out on drums. 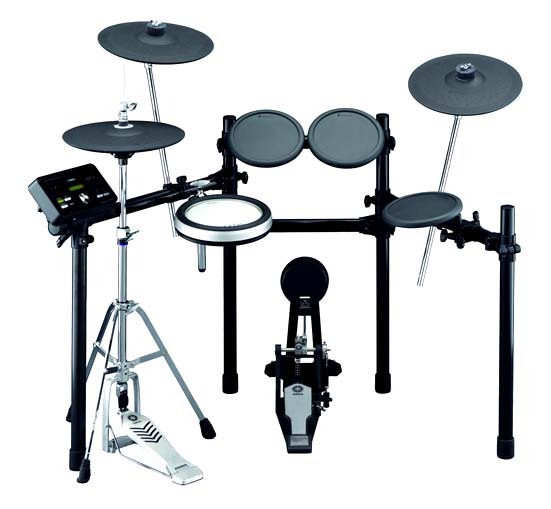 Now let’s look at e-kits – aka electronic drum sets, electric drum kits, digital drum kits. 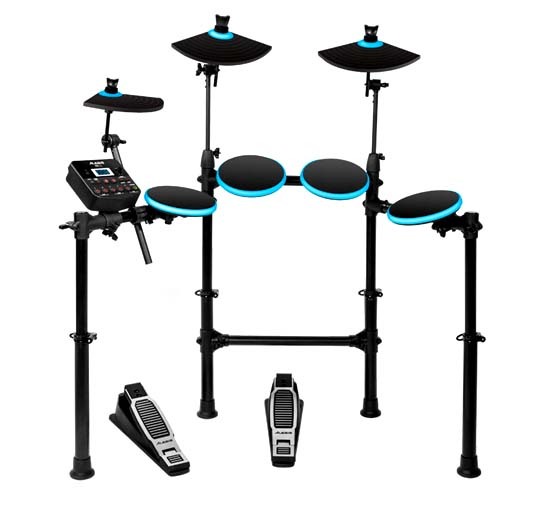 If you’re not sure which electronic drum set to buy hopefully this will be of some help! Electronic drum kits have been around for a long time but really only became a true competitor to acoustic drums around the turn of the century when Roland started pushing out kits with mesh heads. This was a revolution in e-kit design and a welcome change from hitting unrealistic feeling rubber pads. Since then Yamaha fought back with their TCS (Textured Cellular Silicone) heads and to this date the debate of which is better, mesh or TCS, rumbles on. Roland fans prefer mesh. Yamaha fans prefer TCS. Both are lovely. Yes, other people make e-kits but would I recommend their kits? Not at the moment. If you’re in the market for an e-kit make sure it’s made by one of these three or you’ll probably regret it. Roland are most expensive, closely followed by Yamaha and Alesis are by far the cheapest. If you’re not planning on doing exams then don’t worry about matching the above precisely. For example, one crash cymbal is plenty to get started for beginners – plenty pro drummers only have one crash cymbal! So kit size aside, the most important consideration about buying an e-kit is budget – you get what you pay for, simple as. Now, obviously there are deals to be had, kits can be picked up far cheaper in different parts of the world, you can go second hand, ex-display etc. but on the whole the price range between a bad e-kit and a good e-kit is HUGE and the bad news is that (at the time of writing) good e-kits are expensive. If you are paying anything less than around £1,000 there WILL be compromises that at best you’ll find annoying and at worst could be damaging for your playing. To explain this I’m going to pick on two kits – an Alesis DM Lite (around £200) and a middle of the road Yamaha DTX532K (£1,100 ish). So let’s take a look at some of the above points in more detail. Most budget e-kits will have a remote pedal rather than a real hi-hat stand. I must stress as much as a real hi-hat stand is far preferred, it’s not the end of the world to use a remote pedal and plenty players get on just fine with this. It does take some getting used to though and feels very different from a real hi-hat stand. Even ‘real hi-hats’ on e-kits (such as the one on the 532) have their limitations and are pretty far removed from the real thing so don’t go spending nearly £900 on an e-kit thinking the hi-hats will be like acoustic hi-hats – they’re not. Normal playing is generally fine but start to do anything fancy and you’ll see what I mean: ‘splashing’ the hi-hats works about 50% of the time, trying to re-create a ‘half-open swish’ is tricky at best and even with your foot fully off the pedal they still sound like half-open hi-hats – not fully open. As a result a lot of players who practice 100% on an e-kit will really struggle to develop the control needed for the vast array of textures real hi-hats can make. One of the biggest compromises made on el-cheapo e-kits is the remote pedal used instead of a proper bass drum pedal. Again, plenty people get on with the remote pedal just fine but this is a deal breaker for me and in my view, whatever level you’re at, get an e-kit that uses a PROPER bass drum pedal. It can take years to master the art of using a bass drum pedal properly and you’re at a massive disadvantage if you don’t start developing that skill from beginner level. In my view, forget about any e-kit that uses a remote pedal for the bass drum. So in terms of the type of bass drum pad and what to look out for, again these vary vastly in price and quality. The Yamaha KP65 kick pad has been around for years and is fine for most purposes BUT it doesn’t feel great, it’s noisy and it doesn’t work well with a double pedal – don’t get me wrong it’s *OK* but as sensitivity is best towards the middle of the pad you lose a lot of dynamics with a double pedal where the beaters are forced further towards the edge of the pad – this isn’t a massive issue for beginners who probably aren’t using double pedals but it’s something to bear in mind. This isn’t so much of an issue with the Roland kick pads as they’re bigger, comfortably handle a double pedal and are generally nicer to play. 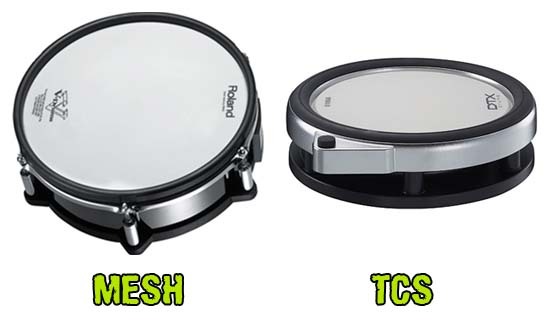 Before talking about more budget pad material here’s the question you all want answered – what’s best, Roland mesh heads or Yamaha Textured Cellular Silicone (TCS)? The answer is they’re both pretty good – not 100% like a real drum but pretty close. Personally I prefer Yamaha TCS but if someone came along and said I could have a Roland e-kit with mesh heads… well I wouldn’t exactly turn it down. In my view the mesh heads are REALLY nice to play but are also unrealistically bouncy. But then some people say TCS has more rebound. You’ll quickly realise Roland vs Yamaha is like Apple vs Android or Canon vs Nikon. Stick rebound from the TCS heads closely matches the levels of rebound I get from my acoustic kit. Since I often use my e-kit for teaching I don’t want students getting too used to a kit with an ‘easy bounce’ as this means you get lazy and don’t bother developing finger control etc. Bear in mind mesh heads are ‘tuneable’ allowing you to control the bounce levels to a degree but I still prefer the feel of TCS heads. That, coupled with the fact that I prefer the Yamaha kit sounds vs Roland (and that’s a very subjective thing… and also varies vastly between modules), means I sit firmly in the Yamaha camp… for now. But both companies make beautiful e-kits. Roland are also one of the only manufacturers that allow you to use brushes on an e-kit… but only on the top of the range kits. I’m sure the mesh vs TCS debate will rumble on forever – at the end of the day both take a bit getting used to and you will prefer whichever one you get used to. Pad zones are relevant to both drums and cymbals and basically allow different areas of the pad to trigger different sounds. For example a 3 zone cymbal pad will make a different sound depending on whether you hit the edge, the bow or the bell. Decent cymbal pads also allow you to ‘choke’ the cymbal. A 3 zone drum pad will trigger sounds such as a rim-shot, a cross-stick or a normal drum hit. Most cheap e-kits will have single zone pads – so the drum will make the same sound no matter where you hit it – you’ll not be able to do a cross-stick at all (bear in mind even at Grade 1 level some of the tunes require cross-stick so forget about practicing that). Almost all mid to high end e-kits will have multi-zone pads. They’re much more realistic to play and single zone pads should be avoided if possible BUT they’re not a deal breaker. For example, you can still learn to hit the bell of a cymbal even if it doesn’t make a bell sound. Pad Size – Does it Matter? You’ll notice some manufacturers make e-kit drums that are huge and close to the size of real drums. Roland mesh pads tend to be bigger than Yamaha TCS pads. 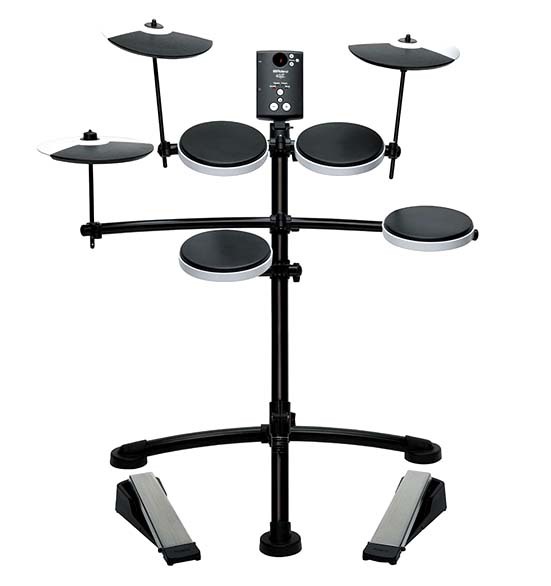 Alesis also sells some kits such as the DM10-X with a 12″ snare pad. So is this something to concern yourself with? At beginner level I would say no. For the additional cost, larger heads offer very little advantage over smaller heads other than looks. Where do you hit a drum? In the middle… generally. So if anything playing on smaller drums can hone your target practice skills! Yes, OK there are obvious advantages of larger heads such as the ability to do effective cross-stick but I really wouldn’t get too hung up on size. Again, several manufacturers are making e-kits attached to real drum shells. This is generally a purely cosmetic thing – so you’re playing a lot of money for a drum shell that serves little or no purpose. Yes, they look nice and if you’ve got money to burn fill your boots but you don’t buy an electronic keyboard because it looks like a piano. You need to view e-kits and acoustic kits in a similar way – as entirely different instruments. Kit sounds are generated by the drum module – this is the ‘brain’ of the electronic kit and one of the most expensive parts. As an example the Roland TD30 module on it’s own is nearly £1,700! Without ANY drums! But don’t worry, you can get a decent module for a lot less than that and I’ll try to simplify things a bit. The number of sounds on a module DOES NOT MATTER. You’ll probably only ever use one kit anyway. What matters is how good that one kit sounds. The more expensive modules generally sound great (and have more sounds to choose from). The cheaper modules often sound pretty awful (and have less sounds to choose from). Some people prefer the sounds of Yamaha e-kits. Some prefer Roland. Some prefer Alesis. I think the kit sounds on my Yamaha DTX700 module are some of the best I’ve heard – at the end of the day Yamaha MAKE acoustic drums and they’ve sampled their own drums! BUT I’ve heard plenty pro players saying they prefer the Roland or Alesis kit sounds. The best thing you can do here is try the kit out in your local drum shop and also BUY the kit from your local drum shop! That way your local drum shop will still exist when the next person comes along to try a kit! Anyone who tries a kit in their drum shop and then buys it cheaper online, shame on you – not cool. Build quality is important if you’re going to be moving the kit around a lot. If it’s going to sit in your bedroom then don’t lose any sleep over this point – there are more important considerations. Yes, if you fall on it it’s more likely to break but look after it and even the cheaper e-kits will probably be just fine. Let’s just quickly look at that Alesis DM Lite kit above. Do you notice something odd about the snare position? who has their snare drum up with the toms like that? …and the hi-hat position? …what’s going on there? It would actually be impossible to set an acoustic kit up to even vaguely look like this and it’s one of my biggest frustrations with entry level e-kits. In this example the snare drum CANNOT be moved into a position where it sits between your legs like it would on a real kit. Trust me, I’ve tried. At best you can get it kind of hovering above your left knee but it’s incredibly uncomfortable to play. Certain beats between the hi-hat and snare are actually physically impossible to play on this kit. For a young player just starting out this is really, really bad. It’s like designing a piano where the keys are too wide apart to play and it’s beyond me why Alesis, who have some really great products in their portfolio, would do this. Surely at some point in the design process they got someone to try playing the kit? The budget Roland TD-1K (still around £340!) gets around this problem by attaching the snare drum to the centre support post, leaving the drum in a much better playing position BUT this kit doesn’t have a real bass drum pedal which is a show-stopper for me. Hopefully you’ll not be selling your kit too soon but it’s a point worth mentioning. The better the electronic drum set the better it will hold it’s value. Cheaper e-kits generally don’t hold their value very well. That said, as with anything – buyer beware! E-kit pads can and do fail – especially the rubber pads. You don’t know what abuse a second hand kit has had – get yourself down to your local drum shop and buy one that comes with a warranty. There’s some great additional information out there in YouTube land but watch out for reviews that are specifically designed to make you buy the kit you’re watching a review of. I do occasional reviews of e-kits on my Andy Mac Drums channel but they’re fairly few and far between to be honest. I can also highly recommend Justin Greenawalt’s channel – this is packed with useful information about e-kit’s including some in-depth reviews and buyer’s guides – his reviews are well presented, independent and he’s bothered to do his homework before pressing record, something I wish more YouTubers would do! So… erm… what e-kit should I buy then? If only it were that simple! Buying your first e-kit is a big ticket spend and not something you should rush into without doing your research first. You need to narrow down your choices and pick a kit that best suits your needs. Is transportability more important than playability? Perhaps go for the Roland TD-1K. Do you have a bigger budget? 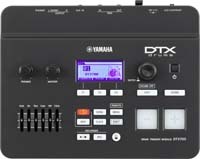 Go for the Yamaha DTX-532K or Roland TD-17KV. Want to go out on a limb? How about the Alesis Surge? Some of the e-kit developments over the last 20 years have been amazing and the top of the range kits from both Yamaha and Roland are works of art… but they come at a price. Alesis are coming along with some very interesting developments such as the Alesis Strike Pro kit… although why you would make an e-kit as bulky as an acoustic kit is beyond me… but it does look lovely. When it comes to choosing an e-kit for beginners as an alternative to an acoustic drum set there are always going to be compromises. All I would say is, if you’re serious about learning to play any instrument you need to have a budget to spend on that instrument and with e-kits especially, you get what you pay for. Many of my pupils have purchased e-kits to practice on – the ones who bought cheap complain about them all the time, the ones who didn’t buy cheap… don’t. A good e-kit will last you a lifetime and will be your primary ‘go-to’ practice tool. A bad e-kit could put you off the instrument for life. If you’ve enjoyed this article please share it on Facebook and Twitter and help spread the word about BeginnerDrums.uk! Next PostNext Do I Need a Drum Teacher?